Rallarstigen (The Navvy Trail), which passes across the outskirts of Muddus/Muttos National Park, is a 44 km heritage trail with a special history. Ever since the 18th century it was an important route, first for the local population, then also for tourists and railway-building navvies. The trail begins at Lake Vassaraträsk in Gällivare and ends in Porjus. Along the way you can see hearths, signs of ancient bark stripping, blazes on trees, and other signs that people have walked here long before us. Hiking the trail also takes you past the settlers’ homestead Stubbávallen. The trail was re-inaugurated in 1994 and renovated with stop-off sites and plankways across wetlands. Dogs are allowed along the entire trail, which is otherwise forbidden in Muddus/Muttos National Park during the snow-free period. Oarjemus Stubbá (Sörstubba). From the ground, Oarjemus Stubbá does not look like a big mountain, but as soon as you begin the trail up you begin to get a fantastic view of the surrounding landscape. On a clear day you can see as far as Sarek. The tour is easy and involves about half an hour walking uphill. The stretch from Hapsasjávrre (near the Inland Road) to Stubbávallen and back to the Inland Road is a suitable day tour. Here you encounter a concentrate of the landscape: pine moors, wet forests and marshes. At the beginning of July every year, Rallarmarschen takes place. Participants can choose to walk or run 23 or 44 km. There are checkpoints along the way. 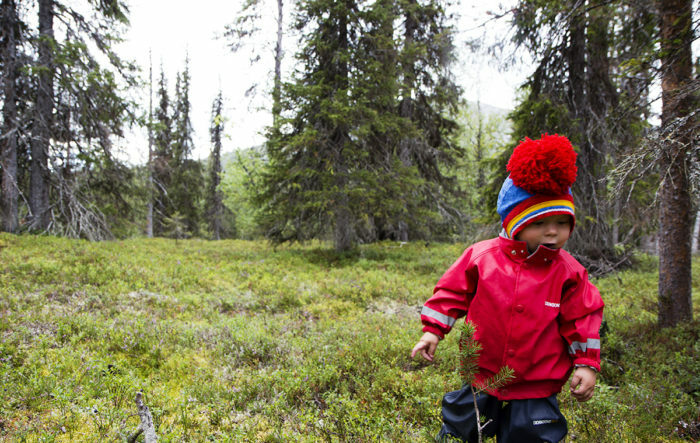 Take the family and get to know the forestlands in Laponia. Some trees bear hewn notches – blazes – that were probably kilometre markings. When the railway to Gällivare was completed in 1888 this trail became an important westward route towards Porjus and Luspebryggan. In 1891 plankways were built by the tourist association STF. In summer 1910, work began on the power station in Porjus, when the trail was given the name Rallarstigen (The Navvy Trail), a transport route for bearers. In 1994 the trail was re-inaugurated with new plankways and red painted markings.